Completion of the FOSA Specialty Day evaluation is required for you to claim CME. Your feedback is also important in providing future educational content. This activity has been planned and implemented in accordance with the accreditation requirements and policies of the Accreditation Council for Continuing Medical Education (ACCME) through the joint sponsorship of the American Academy of Orthopaedic Surgeons and the Federation of Spine Associations. The American Academy of Orthopaedic Surgeons (AAOS) is accredited by the ACCME to provide continuing medical education for physicians. The American Academy of Orthopaedic Surgeons designates this live activity for a maximum of 7 AMA PRA Category 1 Credits™. Physicians should claim only the credit commensurate with the extent of their participation in the activity. 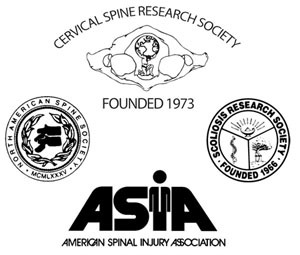 To present a common forum for the four spine societies (Cervical Spine Research Society, North American Spine Society, Scoliosis Research Society and American Spinal Injury Association) to exchange ideas regarding basic science and clinical problems of the spine. To discuss current concepts in diagnosis and management of spinal disorders in the form of symposia, debate, free papers and instructional presentations. To update the review of clinical and surgical results as well as complications.